I’ve long appreciated river confluences where two flows join to make a third, “new” river. The most impressive confluence I’ve visited is where the Bhagirathi and Alaknanda Rivers meet to produce the iconic Ganges at Devprayag, India. (The second image in the Wikipedia article is mine.) Of course, such places are only changes in our human geographical classifications. It is a subjective decision to determine which confluence merits naming a new river or stream, essentially marking its “birthplace”. 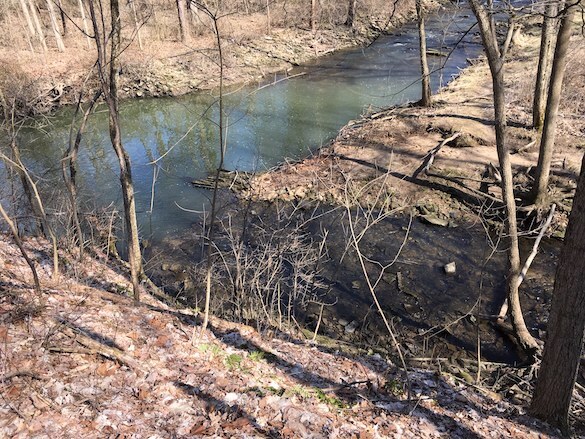 Today Nick Wiesenberg, his father David, and I had a delightful hike through Lowe-Volk Park in Crawford County, Ohio — about an hour’s drive west of Wooster. Within this small park Paramour Creek and the smaller Allen Run join to make the Sandusky River, as shown above. The Sandusky River then flows about 130 miles north into Lake Erie. The Sandusky has played a critical role in 18th and early 19th century Ohio history, so it was a privilege to visit its origin. The weather was perfect for a short hike in the woods. 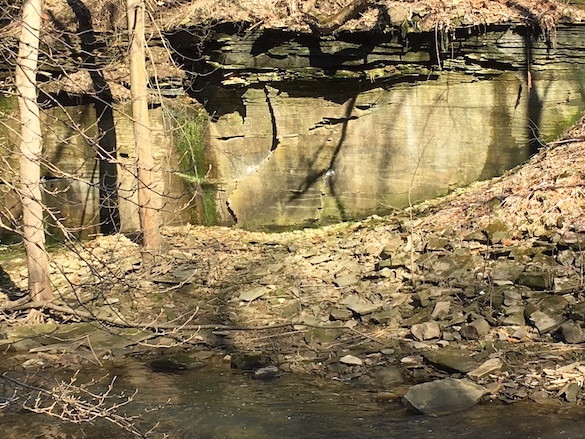 Lowe-Volk Park was established around this confluence and three 19th century quarries in the Berea Sandstone, a massive Upper Devonian unit used throughout northeastern Ohio as a building stone. The quarries are now eroded walls of bedrock slowly being covered by vegetation. As always on trips like this, Nick and David teach me many new things. 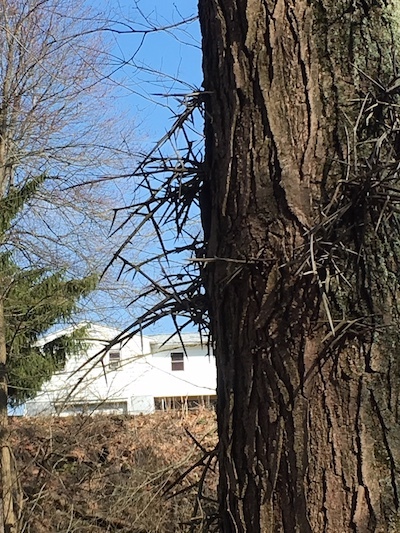 For example, I knew honeylocust trees are festooned with nasty, long thorns, as you can see on this trunk. What I didn’t know was that these defensive structures evolved in response to animals no longer around — mastodons! 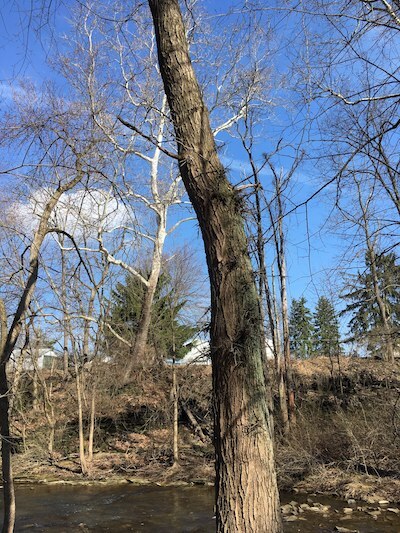 The thorns on the honeylocust trunks go as high as a mastodon could reach, and no more. This was apparently part of a coevolutionary relationship in which the trees had no interest in being pushed over by these pachyderms for their delicious seedpods while they were still ripening on their branches. After the seedpods matured and fell to the ground it was to the benefit of the trees for the mastodons to eat them and pass the seeds through their guts for planting elsewhere, hence their sweetness. Now the thorns mount a defense against lumbering ghosts. Speaking of ghosts, this area was a bloody battleground numerous times, most notably in 1782 at the end of the Revolutionary War. The painting above hangs in the park visitor center. 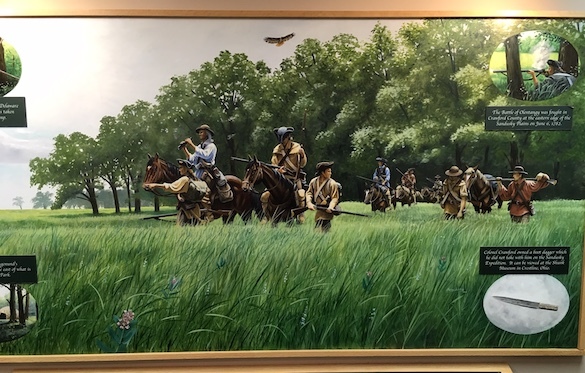 It shows Colonel William Crawford leading an American military expedition against Indian tribes living along the Sandusky River. The Indians, and their British allies, were well informed about this attempted surprise attack and beat it back decisively, giving the name to the fight “The Battle of Sandusky” or “Crawford’s Defeat”. Crawford himself was captured very near the present park. He had a gruesome end in captivity, which was a response to previous atrocities on the part of earlier American raiders who did not, ironically, include poor Colonel Crawford.